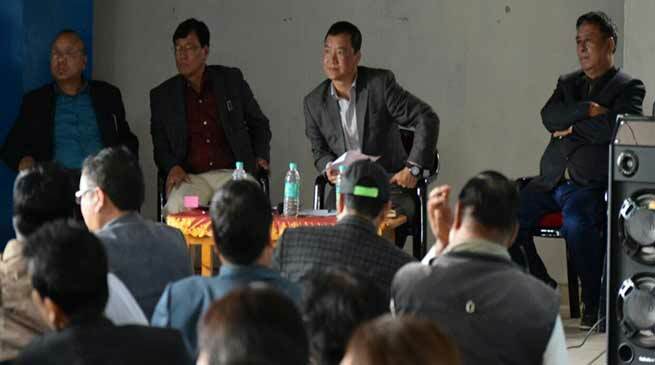 Department of Education under aegis of West kameng District Administration has conducted a coordination meeting with all the Principals and Head masters of all the private Schools of west kameng District under the Chairmanship of Extra Assistant commissioner Nafra Shri Rajiv Chiduni on Wednesday at Mini Auditorium of Govt Higher Secondary School Bomdila. Chairman on his address requested all the Principals and Headmasters of various private schools of west kameng District to change the textbook of class v and viii immediately so that board exam of class v and viii should be conducted from this academic session, all should follow the terms and condition which mention in the school registration letter to avoid any adverse consequences in future uniform pattern of vacation timing of the schools should be maintained. Deputy Director of School Education Shri Dorjee Wangdi Kharma on his address there will be restoration of board exam of class v and viii from this academic session of 2017 – 2018, uniformity of NCERT textbook, uniformity in vacation and holiday, regarding appointment of private school, they must have Diploma in Elementary Education or Bachelor of Education. In this meeting all the Block Education officer, Principal and Headmaster of various private schools of west kameng District and Principal along with his teaching staff and non teaching staff of Govt Higher secondary schools were present.